This season it is the 30th anniversary of David Alden’s association with English National Opera the products of his labour have been enjoyed in London for so long and with mixed reactions to make him always a safe bet for a thought provoking take on the old classics. His hand seems more sure and definitive when it tackles less mainstream repertoire and judging from this Otello that still holds true. The new staging in a multi-purpose single set has the usual signature grey tonalities and sparing use of colour, rusty cinnamon and greens deep browns. 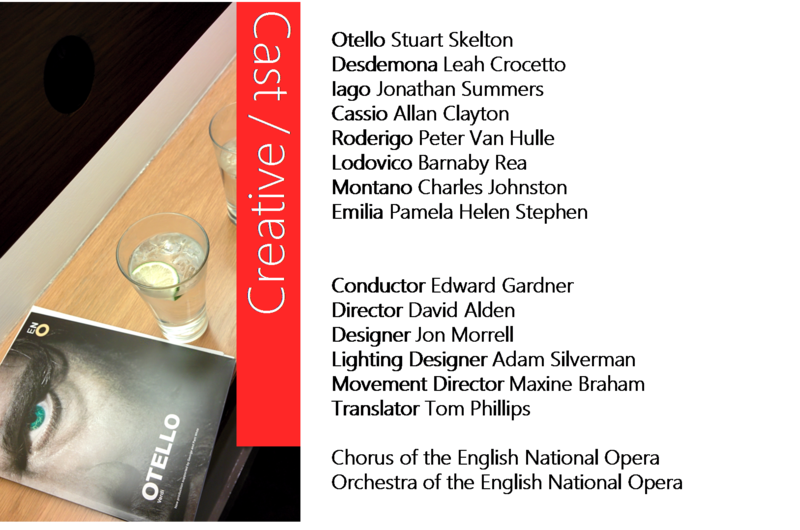 Otello is one of Verdi’s works that demands an uninhibited touch with spectacle, like Aida, it is a game of big choral forces and unsubtle arias and the tragic demise of the heroine. Alden’s directorial concept seems to gravitate into making the story of the wrongly blamed and killed Desdemona into a very public drama. Her arena of suffering being a Cypriot town square of the inter war period. His societal approach is a strong suit and very well done when Verdi’s libretto requires it, but this production totally falls flat and stops being engaging when the more domestic parts of the story unfold. Iago’s Credo is the only intimate part of the evening that truly comes alive. Jonathan Summers steps down from the stage and sits with legs over the pit as he spits out every words as if it soils his mouth one at a time. The intensity of his acting prowess creates a domestic setting out of this Byzantine ruin of a civic square. For the crucial final scene the lack of a proper domestic setting and the very disappearance of the prerequisite bed are puzzling. Desdemona’s whole frame of mind is informed by her enclosed environment of her bedroom, here a wonderful Leah Crocetto is left running about aimlessly covering the vast empty space Alden has cursed her with. To her immense credit it is very difficult to take one’s eyes off her, despite her young age she holds the audience’s attention with skill and with her exemplary light touch. Even if it is obvious she lacks the stage experience of other singers in the role, she makes up in freshness, gloriously spun phrases and charm. Alden’s bigger credit is the extremely detailed for Iago, he clearly gave Jonathan Summers a lot of material to chew over and it shows, his presence is not just menacing but radiates self pity and misanthropy. His singing was probably on par with his excellent acting that underpinned the whole production. Unfortunately the same can’t be said for the rudimentary, bouncer like heaviness of Stuart Skelton. Pouncing on everyone and everything. A particularly ridiculous moment comes when he lifts a leather armchair and stops only short of hurling it into the pit. A ludicrous, monstrous, misjudged personification of Otello that gives him a superficial varnish of thuggery. What is the point of having the vocal goods to sing this part when he lacks the required elegance and acting ability? I am not expecting Shakespearean prowess but do not expect a Jon Vickers tribute act, either. Hope during the run he will loosen up and bounce off more against the more nuanced colleagues on stage and mellow his performance. 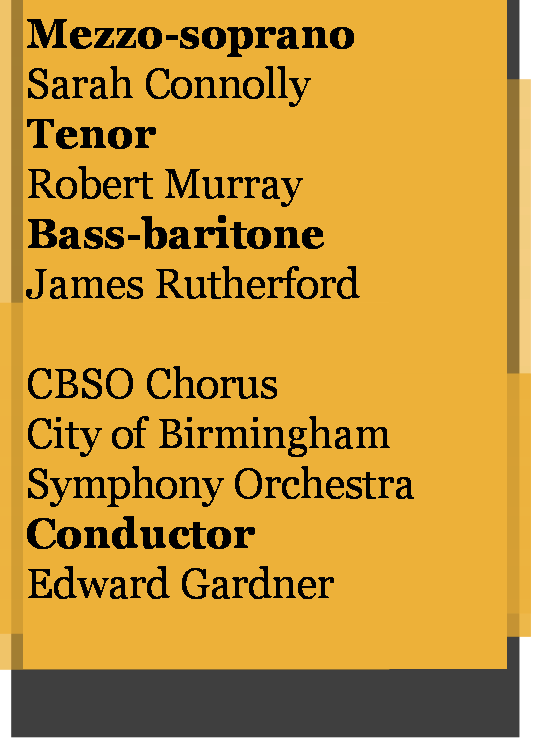 The ENO chorus and orchestra had a more mixed night with ensemble problems especially in the first Act. To make the thundering opening of the opera go past in a near whimper was disappointing, but in reality not helped by the way Alden directs it. The Act Three parade of Venetian dignitaries is much more effective by adding more movement and spectacle. And for once the chorus is allowed to be deployed across the stage and widen the sound stage. If a new production can’t match the impact of Elijah Moshinsky’s ancient Covent Garden show you know you have an issue. Allan Clayton was an exceptional Cassio with wonderful diction and his sweet lyrical tone adding much interest in a character that Verdi spends very little time developing. Not sure why he was portrayed as a drunk, but the sacrilegious fun of using a Madonna and child Byzantine icon as a dart board in a competition with Iago was stroke of genius, as a symbolic finger to the church. Also the Emilia of Pamela Helen Stephen was exemplary in her personification of the innocent bystander watching in horror of the tragedy unfolding. The angular lighting of Adam Silverman was rather stunning to look at despite only having the one vast set to work with, not exactly giving him much to play with. No matter how great or not the individual performances were, this production just felt short on emotion and empathy. Totally missing the great opportunity to depict the light and shade world of Verdi’s (maybe) simplistic universe with nuance and variety. Apart from the revelatory Iago the rest of Alden’s ideas felt distinctly uninteresting. Do go and see if you prize spotting young talent at the start of an international career. Leah Crocetto has such immense promise. The English National Opera seems to be a uniquely polarising company when it comes to critical opinion and bloggers in the UK. Most are very happy to point out its faults (most of the criticisms if inverted could be used against the Royal Opera rather easily, when it comes to programming) and all its missteps. 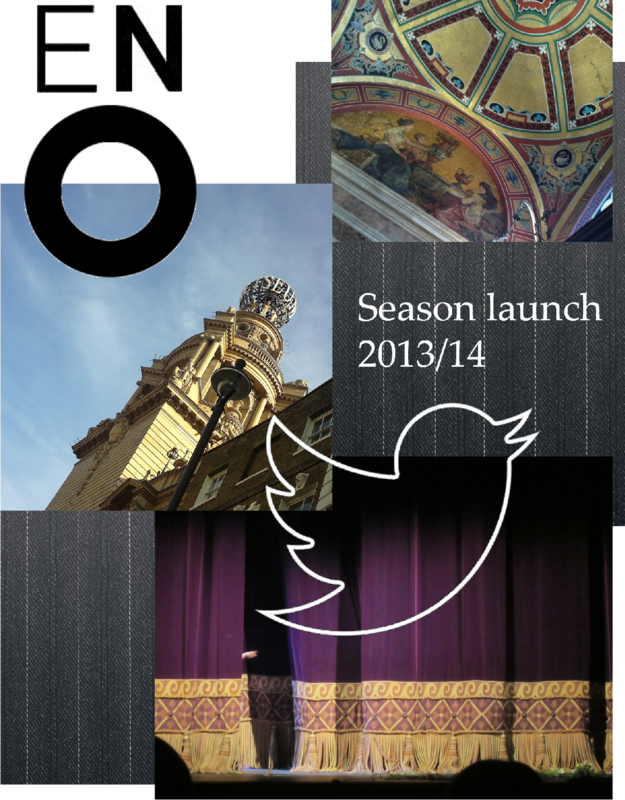 I was invited to the launch for a second year and it was interesting to mark the change in atmosphere. Lots of vocal critics of the company are too happy to castigate the inadequacies of the arts journalists and their apparent failure to address burning questions on the financials and the artistic decisions there. What of course they make no allowance for is for all the things that ENO does very well and in some cases is a leader in the field. Frequently the feelings of overwhelming hurt uttered by some people online make me wondering what their true motives are. A press conference is not the place to ask probing questions on the financial state of the company but surely a good place to try to discern what the atmosphere is like and to try to see beneath the veneer of rehearsed confidence. This time the managing trio of Gardner/Berry and Tomasi were surely much more subdued overall but clearly wanted to give an upbeat flavour to the announcements. ENO has been a director led house since the 1980s with a more edgy outlook. If that is not what you want out of opera then maybe don’t waste your breath on complaining like a demented person. 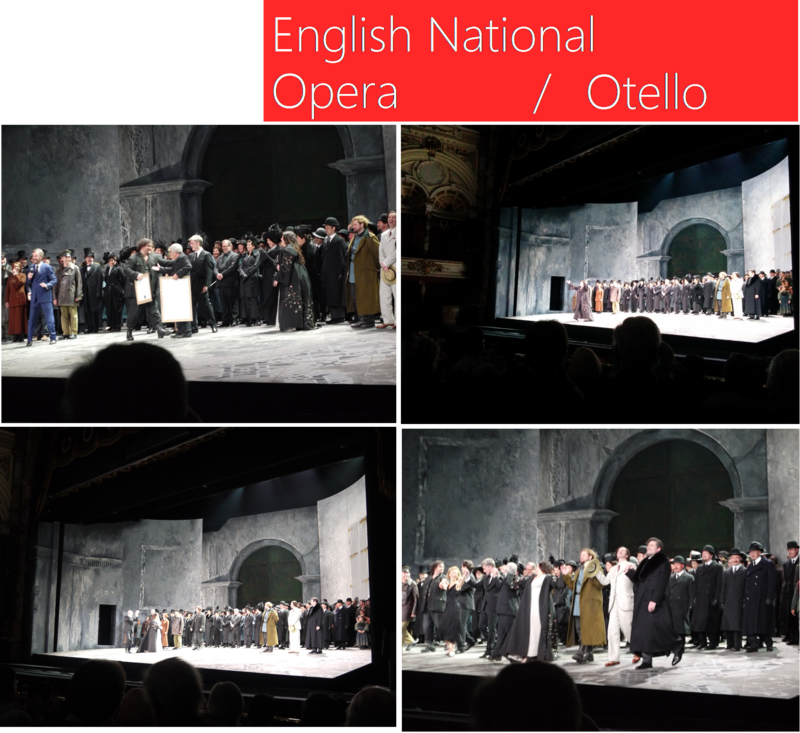 I am sure hearing Christopher Alden and Calixto Bieito call ENO an institution that understands their needs and becomes a base of sorts for them, must be like a red rag for the pithily referred to “regietheatre”. Like it or not, directors like Pierre Audi, Bieito, Richard Jones, David McVicar and the two Aldens have made an indelible mark in the operatic world of the last twenty years and no amount of circle jerking over tired productions by Zeffirelli and Ponelle will change that. Move on with the times or move along. It is well known that John Berry likes to draw theatre, film and artists to collaborate into their first operatic directions. Some of them have been very successful, like the Anthony Minghella Madama Butterfly and Terry Gilliam’s staging of Le Damnation de Faust and some have bombed like last year’s Giulio Cesare by Michael Keegan-Dolan. It seems like a luxury for many but it seems also intricately linked to the current artistic outlook of the company. This season he has invited Joe Hill-Gibbons, a theatre director by trade to try his hand at opera with Powder her Face. The vehement anti-ENO brigade seems to be too unwilling to acknowledge that they have artist development schemes for conducting, instrumental playing, libretto writing, singing and a newly announced young house composers scheme. They seem serious about opening the doors to more creatives into the world of opera and that can surely be a positive development for the future of the art form. The financial state of ENO is apparently improving with the deficit down by two thirds (£800.000) and box office intake rising to £1.3m. The somber tone of their CEO Loretta Tomasi was indicative of taking seriously the situation and explained that they were successful into applying for a £3m fund (Catalyst Arts) from the Arts Council that hey have to match with a fundraising drive of £6m, which it stands currently at 85%. This expendable endowment will be used to fund production costs, which seems like a sound way to use it. The only alarming aspect was her emphasis not to be too over-optimistic if there is another funding cut by the government this June (it seems likely to be another 10% cut in tune with current government policy). Of course what is worrying is that the current losses are essentially wiping out their reserves. And while the Catalyst programme is a great idea it will not pay the staff or any other day to day costs of the operation. Unfortunately they did not announce any changes to the core ticket prices just the continuation of the (rather naff) Opera Undressed scheme and the increase of ticket allocation from 100 to 200 per eligible performance. They seemed happy that 26% of participants in the scheme returned for more ENO shows. Also they announced the launch of Secret Seats (£20 paid and a seat allocated two days before the performance with a value of £27 or more, with Stalls and Dress Circle seats also part of it). That pushes the overall seats available for under £40 by 40% but of course it doesn’t address the constant discounts of top price seats and the all too infrequent sell outs. Terry Gilliam’s take on Berlioz’s Benvenuto Cellini. Gilliam will come up with some odd ball ideas and the accomplished cast with Edward Gardner conducting should make it an enticing evening. Calixto Bieito’s Fidelio will be an interesting proposition, especially the nights when Stuart Skelton is singing the lead. Richard Jones’ take on Rodelinda, remarkably, only his second Handel direction to date, will surely be memorable and with a great cast. ENO’s time to prove that they can live up to their reputation for being the London House for Handel. And make us forget of that awful Cesare. Julian Anderson’s Thebans directed by Pierre Audi will be an interesting new work. Gardner said at the press conference that it has some remarkable writing for the chorus, which is frankly a good omen for a work based on Greek drama. Thomas Adès’ Powder her Face in a new production by opera first timer Joe Hill-Gibbins in a site specific staging away from the confines of the Coliseum is an intriguing prospect. In the least desirable corner, my pick is the new Cosi fan Tutte (who knew we needed another new staging in London) especially when it’s libretto will be tortured by Martin Crimp. Overall the programming is giving me a lot of fascinating productions to look forward to and many hours of Twitter fun while I’m trying to have a reasonable conversation why the company has something interesting to say aside for the odd turkey here and there. At least they have the balls to take artistic risks, just wish their financial standing was much more solid. The end of the year and we all give in to the convention of going through the draws of our minds and paying tribute to the most entertaining and uplifting events of the year. I published a top 11 list last year and thought I’d avoid innovation and go for a top 12 for this year. I am only hoping I will not be blogging in the year 2040 as the list will become too long. Was a cross-disciplinary spectacular. Thought as unstagable but somehow Graham Vick managed to take us all on a journey. It was cooky, it was extravagant and above all a memory to last a lifetime. Cue in helicopters, cosmic camels and a trombonist in a paddling pool. Here’s my post on the experience. Her interpretation of Winterreise was one of the most moving performances of the year. Her programme in honour of Kathleen Ferrier was a joy to listen to. Her concentrated deeply tragic version of Britten’s cantata Phaedra was also wonderful. We are very lucky to have her and delighted the Wigmore Hall thinks so too. The CD and download of her Wigmore Hall Winterreise is available to buy from 8 April 2013, here’s the link to the Amazon UK page. English National Opera were so right to bring to London this extraordinary directorial tour de force. One of the few times when a very strong directorial concept marries with an opera so deeply they become one. The production was an earthy manifestation of Bizet’s masterpiece with such assurance and self-containment that enthralled. That was a night of wonderment and astounding depth. Even the creaky fusty old production didn’t matter. It was impossible to avert one’s eyes from the purposeful, intense Desdemona underpinned by a complexity so inspiring. Harteros may have a lot of detractors and her record at showing up for shows may not be the most consistent. This performance left me tingling and wanting to see her again soon. What a beautiful, non-fussy production with a great cast that understood what Strauss is all about. John Tomlison, Sarah Connolly, Sophie Bevan and Amanda Roocroft had a wonderful chemistry on stage with Edward Gardner creating a most dense gold coloured sound from the pit that made it a very special evening. A beautiful steam punk inspired production by Thomas Allen made by a singer for the singers. Showed Scottish Opera in a great light despite the recent financial and organisational ups and downs. It was well cast and the sure-fire hit they need to help them stay relevant and afloat. With the great sets of Leslie Travers and pacey direction of Tim Albery. The performance was built around the radiant and alert performance of Sarah Tynan who was an ideal Cleopatra and Pamela Helen Stephen’s earthy Caesar was the compete opposite all battlefield mud and conflict. The production was tightly knit and beautifully sung throughout. The Royal Opera may stay away from any baroque opera but thank heavens that regional companies are not as apathetic towards the interpretation possibilities of it. And are willing to tour it across the country to thousands of people in the regions. I still remember the buzz before her unexpected recital in March (she took over for an indisposed Giuseppe Filianoti) rushed to grab some tickets to see her and was not disappointed. Her creamy delivery and melting honesty was such a potent blend. She is an artist to watch and can’t wait to see her return to London very soon. She is firm favourite of mine and had the chance to see her in action twice in the last few months at the Wigmore Hall. Her delivery of mélodies was exemplary, fusing a breezy natural style with a warm stage presence. Her singing manages to look effortless and yet is full of innate good taste and finesse. 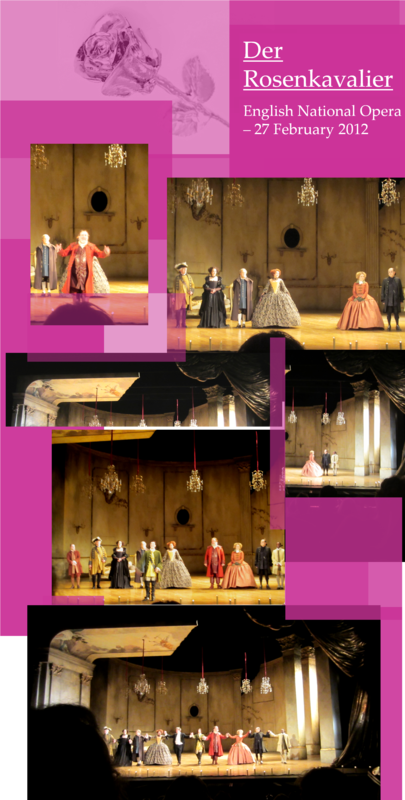 The production was overall hit and miss, but the incredibly vibrant, Cassandre of a real tragedienne like Anna Caterina Antonacci the butch Enee of Bryan Hymel, the variable but very regal Eva-Maria Westbroek and the sparkling tenor of Ed Lyon made for a very memorable musical evening. So much so, that I snapped up another ticket and made my way to the very gods of the lower slips of the Amphitheatre not phased by the uncomfortable sitting arrangements over the over five hours duration. It was my first visit to Glyndebourne and it was everything I hope for and even more. Both productions were simply magical. Especially the brand new L’enfant et les sortilèges was as joyful to watch as it was to listen. 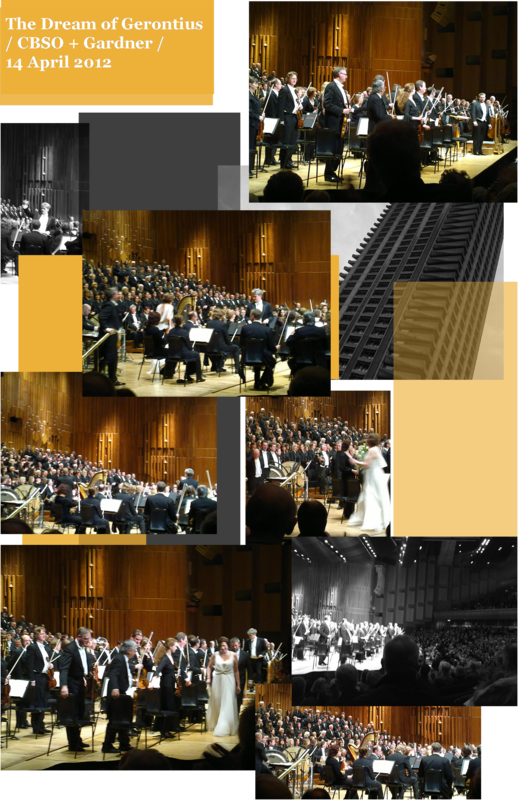 The London Philharmonic played with such distinction and style that left us buzzing. Also the long interval was very welcome and our restaurant meal was expensive but also utterly delicious. Laurent Pelly was clearly at home in the whimsical and magical worlds of the two jewel like operas. Another firm favourite and one singer I can not have enough of. Saw her sing Elgar, French baroque and Strauss. All of them distinctive all of them spectacular in their own right. Her upcoming Charpentier Medea with McVicar directing for ENO will be a great start for 2013 and her appearance as Phèdre in Hippolyte et Aricie at Glyndebourne will have me booking for a return trip to East Sussex in August. Click here to read the posts. So many more entries could have made it here but the above are a quick distillation of some great evenings out and being present for some music making of great quality and variety. 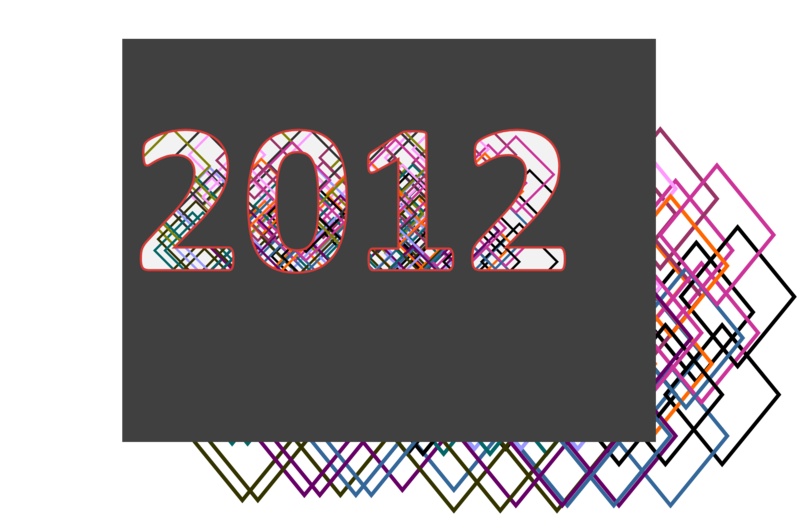 2013 will hopefully be as full and interesting, maybe even bringing with it some surprises and new discoveries. A big thanks is owed to all my readers for putting up with my meandering blog posts. Have written this blog based on my belief that opera is alive and constantly changing and as a way to inspire others to give it a go. If just a single reader was inspired or intrigued to go to an opera or classical performance in the last year, it would make writing this blog all the more enjoyable and purposeful. I have been hosting the blog posts of Claire Pendleton from the ENO chorus for the last month and I had a good idea about the set up and direction of Julietta and even had a sneak peek view of the set during rehearsals. But the great unknown was always the work itself. Martinů takes the dreamworld of the original play into an extreme, his composing becoming fragmented and episodic, very few of the narrative threads are followed through and much of the singing is a recitativo accompanied by pillowy (at time wondrous) music. It makes for an unsatisfactory night at the theatre if the audience is not prepared to take it at face value and allow itself to be seduced by the spare but oddly voluptuous soundworld of Julietta. The heroine is a dream and it seems so is the possibility of a coherent narrative. This production was immaculate and the orchestral playing was tremendous. Particularly how it was customised to the sometimes too hot acoustic of the coliseum was an impressive feat. The music sounded distant and echoing at times and others the fortissimi braced the material into shape. Edward Gardner as an astute and highly theatrical conductor managed to bring out a wealth of beauty and lyricism. The woodwind passages in Act Two were truly delicious and worthy of the concert hall let alone the opera house. The singing was mostly exceptional, Peter Hoare was tremendous as the dream swept Michel and managed to take us all on a journey as he gradually starting losing himself and his own memories and retreating from reality to the uncertain world of dreams. His singing was always assured and full of spark. His Julietta was as ethereal and edgy one would wish Julia Sporsén (who was unfortunately let down by the orchestral balance on appearance in Act One) sang with an airy confidence and strong stage presence. We could surely see why she made such and impression on Michel. She made a great case for ENO’s frequent casting of singers from its own young artist programme for major parts. If she was that wonderful on opening night imagine how much she will grow through the run. The chorus who mainly creates a reflective echoing sound through the first two acts was a great asset and established the mood set by the orchestra. And also supported Michel in his attempt to find his way through the provincial town he found himself stuck in. Also Claire did do a magisterial dash across the stage in Act Two, as mentioned in a previous blog! From the smaller parts Susan Bickley was a tremendous presence and the source of much hilarity either as the fortune-teller that talks about the past or as the old woman coming out to admonish Michel. Henry Waddington made an assured man at the window plus a dry witted waiter in the Second Act. One singer that made a distinctly bad impression on me was Emile Renard who maybe too carried away by the little arab character just oozed arrogance throughout the evening. Especially when she was out-sang as one of the three men by Clare Presland and Samantha Price. She has a lovely lyric voice but her stage presence could use a little bit of toning down. The production by Richard Jones was well honed (after all this is the third incarnation of this production since 2002) the three differently orientated accordions created a suitably surreal and evocative setting. One slight annoyance was the flimsy construction of the instrument in Act One with the doors almost prematurely flung open on impact. I can imagine Julietta with its sparse orchestration can be a victim to a director’s whim to add extra clutter to make up for it. Jones went against the grain and allowed the music and signing ample space to breathe. His attention to physical acting paid dividends, both Hoare and Sporsén gave us a fully lived performance of great distinction. The addition of the custom curtain design made up of white drawn sleepers in pyjamas spelling out Julietta, with Michel being the last one on the lower right was a nice touch and when it re-appeared in the end it brought the story to a circular conclusion. Another beautiful touch was the wandering french horn player in the wood of Act Two adding another surreal touch in addition to the wine waiter and a piano being “played” by Julietta on a moving platform towards the back of the stage. Ah Rosenkavalier, the most delicious torte of the lot! The usual upturned noses in the circuit will have scoffed at the idea of having it performed in English. But they shouldn’t have worried too much, this was an evening of pure decadence and pleasure. McVicar’s set all cream walls, decorative pipped on plaster work, painted ceilings, mirrored screens and swathes of gold lamé fabric and parquet flooring. The detailing was rich enough (despite a few complaints about the use of the same set for all three locations) and the direction was fluid with attention to the action and the glorious music. After the dud Don Giovanni at Covent Garden this was a moment of musical catharsis. Add to that a cast that summed up some of the greatest British singing talent of the last 30 years and you get an idea how fantastic it was. Not bad for what is meant to be London’s second opera house that apparently can’t afford big stars. Amanda Roocroft’s voice may have lost some of its sheen, but her stage presence is the very essence of old-fashioned glamour. Her Marschallin is charismatic and sang with so much heart, its instantly winning. Her fragility and lack of comprehension of the vanishing world she inhabits is brought out by the staging, her boudoir lavish in small details but overall it seems in need of a fresh lick of paint. Her cavorting in bed with Octavian is fun and warm, her refuge from the pretentious Viennese high society. The role fits her like a glove. Her knowing glances after she lets Octavian go and straight into the arms of Sophie was beautifully acted, as the woman who gives in to young love with an air of a lifetime’s experience. John Tomlinson is one of the greatest names of British operatic singing. His horny Baron Ochs was fun-filled and showing off his apparent lack of sophistication. His red cheeks with the exaggerated make up added another goofy touch. His energy and enthusiasm never waned and his particularly lecherous approach to the young Sophie on the wedding day was perfectly judged, slimy in its upper class snobbery but yet pathetic in his disregard for her feelings. Also the way he addressed the Marschallin in the first act was the look of a man who knew his place despite his bone headed arrogance. Sophie Bevan was a deeply elegant Sophie who waded through her high notes like a fish in water. Her charm and beauty propelled her stage persona. Her falling in love with Octavian during the presentation of the rose was perfection. The wide eyed expression she sported as Connolly showed up in her splendid gleaming suit of armour was that of a woman falling in love for the first time, blinded by the magnificent sight. Awkward and overwhelmed she grew in confidence while trying to see if Octavian was feeling the same way. After her splendid turn in Castor and Pollux last winter she proved herself to be a bona fide star soprano in the making. Sarah Connolly in her latest and maybe one of her last assumptions of the role of Octavian (she’s moving slowly into different repertoire leaving trouser roles behind) was a joy to watch and to listen to. Her acting from young louche young aristocrat to a cross dressing country maid was every bit as entertaining as it was sublime. She was radiant and in very good voice. She was the glue that held this show together. Her presentation of the rose was poised and a perfect foil for the youthful blonde charms of Sophie Bevan. A moment so perfect that the world seems to stop for a millisecond and observe the beauty. One of those performances that look effortless but yet are truly intelligent. The journey from the Marschallin’s bed chamber to the final trio was the journey to maturity through the course of true love and it’s many (sometimes hilarious) obstacles. The production was verging on the unapologetically traditional. It’s the shock of the traditional, you may say. Thankfully an abundance of physical comedy touches added whimsy. Also the fun translation and crisp enunciation by the cast made a good ambassador for opera in English. A particular joy was in the final act when Connolly in the guise of the maid Mariandel sounded like a Victorian street urchin, all mangled consonants and flowery slang. The orchestral playing under Edward Gardner was truly spectacular, with focus and softness at perfect balance. After all, this neoclassicising confection has always had a hint of irony under its expensive veneer. Gardner brought out the incidental humour, cheekiness and all the bitter-sweet harmonies that Strauss endowed this most self-consciously rich score of his operatic career. We left ENO with a sense of deep satisfaction and were glad to be surrounded by a much more attentive audience than in most London venues. That kept silent throughout and generously applauded in the end. I only wish I had seen it once more.